There are some days where I can’t believe it has been over 4 years. There are other days where I can’t believe it has already been over 4 years. It was about 4 and a half years ago that I came face to face with the fact that my son’s speech was not developing as it should. As a professional in the field of developmental disabilities, you would think that I would take action quickly and easily. But I didn’t. I couldn’t. I didn’t want to. You see, I didn’t want to invite a “word,” a “label,” a “disability” into my house. By giving it a name, it became real, and it did. That one simple word “apraxia” meant that my son would need therapy. A lot of therapy… years and years worth most likely. And the therapy would not be occasional either. Therapy for apraxia of speech is intensive if done appropriately, so that neural pathways can become paved with high tech asphalt and not bumpy crushed stone. Childhood apraxia of speech meant that my son would be ripe for bullying, ripe for exclusion, ripe for judgement, ripe for pity as many people with disabilities are. “What’s wrong with him?” “Why is he so rude?” “He can’t talk so he doesn’t want to play.” “He can’t say his abc’s, he must not know them.” The playground for me became one of anxiety instead of one of free fun. A diagnosis of apraxia of speech meant that there was a strong possibility that reading and writing and math would be difficult, even if speech came quickly. Language use and not just speech production, is an important foundational piece to many school related tasks, for all kiddos. A diagnosis of apraxia of speech meant that the first time my son said “I love you” was with a communication device (AAC). That didn’t matter though because the hugs, the kisses and the pride my son showed in saying something on his own were all just like hearing it from his own mouth. The word apraxia meant that parent teacher conferences and accolades from proud teachers would instead be likely replaced with meetings and discussions and emails focused on what my son was constantly struggling with… every single day. I knew this is what this word would bring. And it did. All of it. What I didn’t know was that this word would bring other words along with it too. These words I had to take time to look for, because if I didn’t see them, it was possible that no one else would either. Words came along like: persistence. My little man can stick with anything that he sets his heart to. It is his greatest strength. He uses it in soccer. He uses it for reading. He uses it to crush his older siblings in video games. Resilience: This is a kiddo who can get knocked down and stand right back up. As his mom, I needed to find this word for myself as well. Mindfulness: In waiting for each and every smile, sound, syllable, word, I remembered the need to enjoy all of the littlest things in life. Things are not given to all. What we have, we must cherish! Team: Even as a therapist, I knew the importance of a child’s team. Give and take, discussion and persuasion, limited fighting and instead focusing on the little person in front of you and what is best for them. As a mom, I needed my own team too. Find the best people you can and surround yourself with them! Inclusion and Acceptance: As my son worked on finding his voice, my other children became aware of his struggles and became advocates in their own right so that their brother would not have to face extra challenges. To my surprise, my older son actually asked his teacher why a young girl in his class didn’t have a communication device of her own. That summer, his entire class read “Out of My Mind” and had whole class discussions on presuming competence in people who don’t have their own voice. BONUS! Independence: As a mom it’s so easy to hover over our little baby birds and keep them safe in the nest, away from all of the mean, nasty vultures of the world. But over time, this strategy doesn’t serve either of us. Our little birds need their own wings, their own voice, their own courage to fly. Can we provide the parachute to soften the landing, you betcha. But we need to be willing to let them fall first. This is the only way that they can truly find their own abilities to soar into their own amazing life. Courage, love, faith, hope, joy, gratitude, action, honesty, problem-solver and self-compassion… these words came along too. I realized in our journey that it was so, so easy to blame this word or any word really, for how life lined up, for how life was, for how things were. For a long time, I let the word drive everything. Then as a mom I realized something even greater. I had a choice, every single moment of every single day to choose how I showed up to the world. My son, regardless of that word, had the same choice. No, he couldn’t avoid the mean nasty vultures of the world, but no child can. Did he have apraxia and did he need support? Yes, but he had something greater, he had all of those other words as well. Each and every day he could choose how he showed up, how he reacted, so that he was always his best self too. That’s all any mom could or would want for their children, don’t you think? When a disability word enters your child’s life, it is so easy to focus on the never, can’t, won’t… since these are often the words we see and hear from all around us. Just remember to focus too on the can, does and totally wills in their life and your life as well. 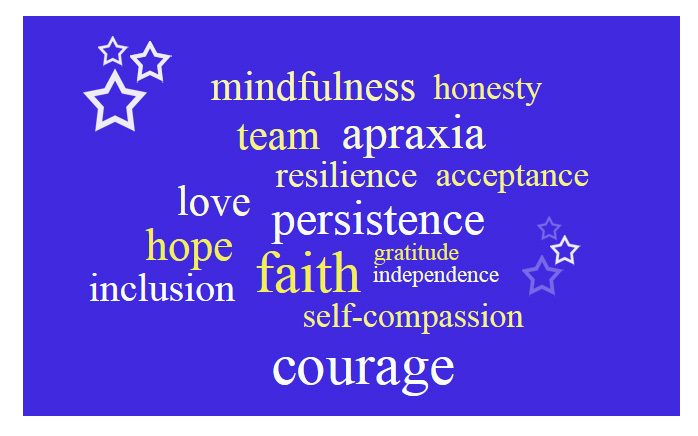 May 14th is National Apraxia Awareness Day. Apraxia of speech is a neurologic motor speech disorder that effects how words get from the brain and coordinate with the body to produce verbal words. It is considered rare and requires a knowledgeable Speech Language Pathologist to distinguish it from other speech disorders. When I first let this word into our lives, I discovered the right treatment, the right approaches and the right supports. This word also gave us the right direction for helping my son to reach his dreams. In March of this year, my son and I were told that this word “apraxia” no longer describes my son. It is still a part of him and a part of his journey, but the word itself no longer has any hold on his future. The other words I mentioned? Yes, they still do. As always, if you believe something might not be developing with your child the way it should, contact your local early intervention office if your child is between the ages of birth to 3. If your child is 3 years and older, contact your local district and ask to have your child evaluated. Early intervention is key! For more information about Childhood Apraxia of Speech, check out apraxia-kids.org ! For more posts about our adventures with apraxia of speech, click here. You’re beautiful! Just wanted to tell you that. Thank you Sales 🙂 What a sweet thing to read in the comments!!! Thank you for stopping by and leaving a message 🙂 The image is actually from CASANA for public use so please! If you haven’t already, check out the Apraxia-kids groups on Facebook. Wonderful resource!!! 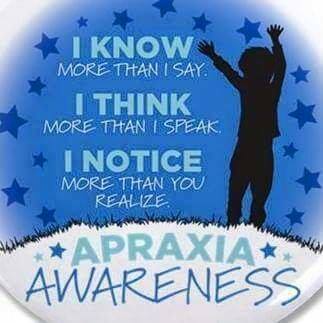 https://www.facebook.com/groups/apraxia.kids.group/?ref=bookmarks You got this momma!! !